360-Degree Feedback is a multi-rater feedback process in which an employee receives confidential but anonymous feedback from subordinates, peers, customers or clients, reporting managers or any other people who work around them. This is a kind of appraisal tool, which measures the performance of the employees. The employee receives an analysis of how he or she perceives himself or herself and how he or she is perceived by others. The feedback forms include questions that are measured on a rating scale and also ask raters to provide comments. The growing irrelevance of top-down performance reviews has led to more topdown/bottom-up assessments, and eventually to the 360-degree assessment. 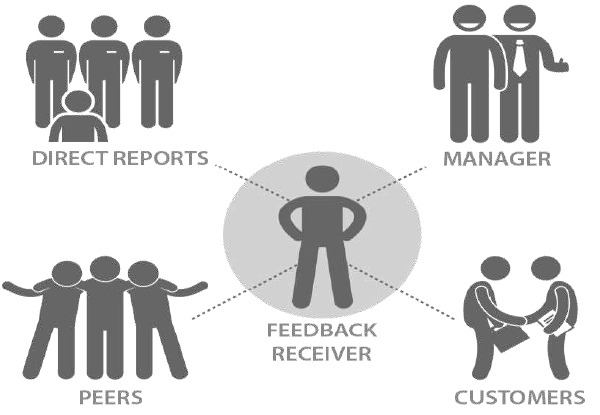 In a nutshell, in this system of feedback, not only the superior but also the peers and every stakeholder of the organization evaluates and comments on the performance of the employees. Need for any change or development in the employees are revealed. Establishes increasing communication in the organization. Drives training to ensure more client or customer satisfaction. Better career development for the employees. The 360-degree appraisal gives the HR Department an upper hand to gain better understanding of the competitive advantage and disadvantages of the current human resources and tune them towards performance excellence and productivity. It fits well into a large organization as it touches every stakeholder in assessing the efficiency and performance of an employee. As discussed earlier, 360-degree appraisal is a multi-rater and feedback system, widelyacknowledged appraisal model in the world today. The basic principles of this popular appraisal system are as follows. The employee is assessed yearly or even half-yearly by a series of assessors such as the manager, immediate subordinates, peers, and internal and external customers. 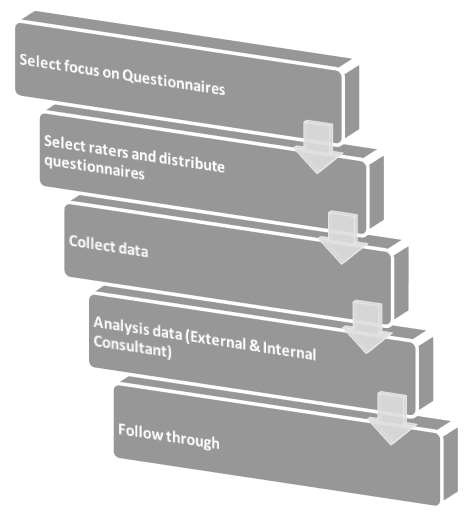 The aforesaid assessment is carried on with a questionnaire, which is specially designed to assess behavior critical for performance. The assessment is consolidated and feedback profiles are prepared and shared with every participant either by the HR manager or the department in a performance review session. It is powerful, accurate, and reliable compared with the tradition feedback system as it conducts an impartial and objective assessment. It also involves all those who are related to the targeted employees. It addresses various skills such as resource management and goal setting. It is multi-dimensional. It also emphasizes subjective aspects such as teamwork, leadership qualities, and overall character. Why should I improve my performance? 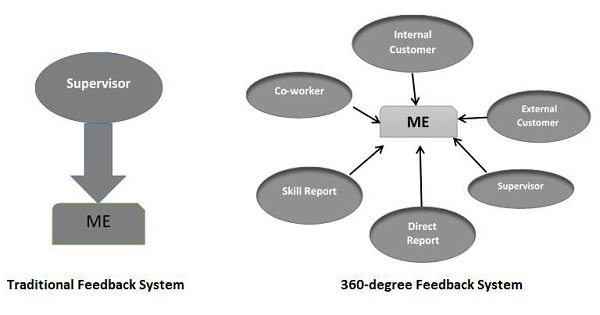 The following diagram shows how 360-degree feedback is different from the traditional feedback system. 360-degree feedback system is a wholesome appraisal method. It assesses and provides feedback about the employee’s work-related behavior and/or performances by soliciting information and data from a variety of workplace sources. It first became popular as 360degree appraisal system in the US and today a large number of Fortune 500 organizations are using this non-conventional appraisal measure in some form or the other.